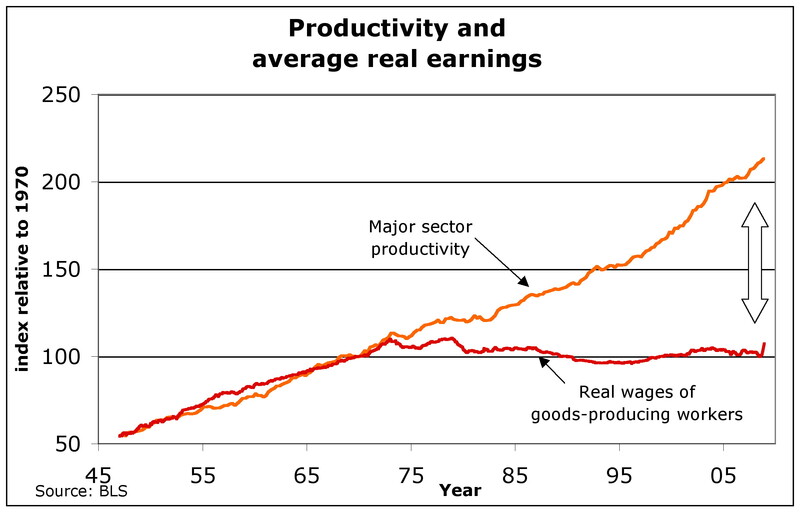 I get the first half of the post about wages and productivity. The second half about food seems a bit confused to me. I’m sure you appreciate food is itself a big and complicated subject, but here are two quick points. First, world population has increased from 3.6bn in 1970 to 6.7bn in 2009. 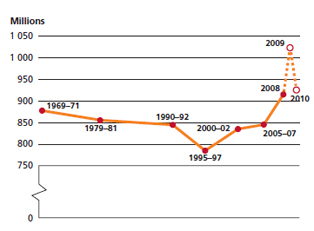 So even taking the malnutrition spike in 2009 as the end point, undernourishment has fallen from 24% in 1970 to 15% in 2009. For those who are not malnourished but not so much above that line (the bulk being workers in the developing world with some of the poor in the developed world) the amount of food is more directly affected by wage levels. 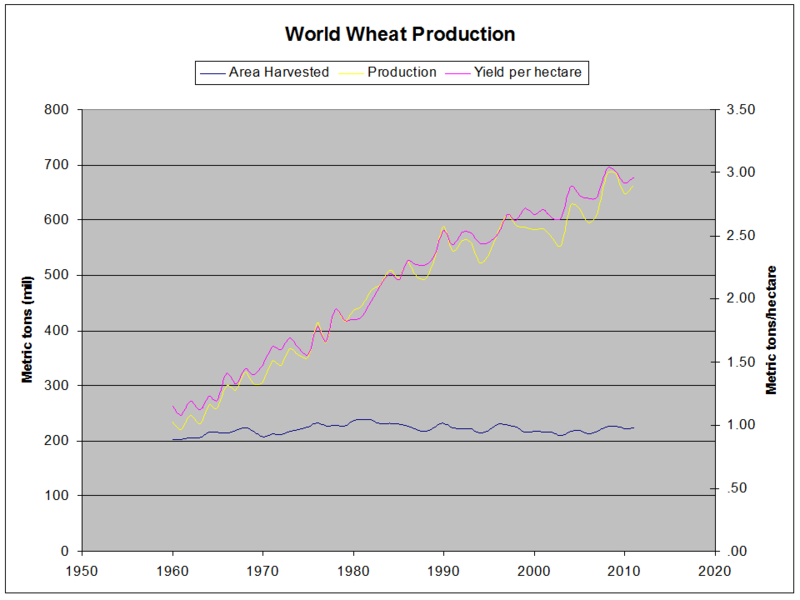 Here raising consumption (and there has been a large rise in consumption in e.g. China) is a matter of trade offs. Of course this maybe one reason that it is much more popular to focus on the bottom billion than the middle billions. Most of the very hungary are subsistence farmers who can lay claim to more of what they produce than most – that’s not their problem. Everyone (except maybe a few greens) can get behind turning the poorest into productive wage workers. What happens next is more controversial. Guess when we left the gold standard. This has nothing to do with the Gold Standard — the timing is coincidental. The only explanation I’m coming up with so far is a loss of labor clout relative to owners. Labor doesn’t have the power to demand that productivity gains be passed along to them in the form of higher wages. It was the birth of neo-liberalsim. The Start of the globalism craze. America and the UK practice no-holds-barred globalism. Multinationals (born from globalism) rule the world now. They operate in the international sphere, some of them have more economic power than countries, and as such they go from one country to another dictating labor laws and taking advantage of loose laws. They also benefit from monopsony. Because of the cheap labor they now have access to, it depresses wages here. Traditional capitalism with the independent businesses never had access to these foreign labor supplies like multinationals do. Hence its a golden age for multinationals and independent business are kinda the red headed step child. Globalism was what broke the wage-productivity bargain prior to the Great Depression and was a cause of the Great Depression. Same thing happened for the Great Recession. The attempts at globalism in the early part of the twentieth century were undone by returning to protectionist policies, which are the same thing we have to undertake to fix our current problems. It was the power that unions grew to hold that kept wages going up. With globalism, unions were beaten down, ironically in some regards by the very liberals who helped create them. The focus around 72 shifted to individualism and unions are collective. We’ve since shifted from a manufacturing to service industry, making it harder to unionize and lower wage jobs. Plus, the media has done a good job of destroying the unions image in the eyes of Americans. Here is another example why homelessness is skyrocketing in the United States. This link goes to a private-only blog. Whoever wants to get this message across has opted for a self-defeating strategy. Not a sign of commanding intelligence, so their assessment of the ‘myth’ that the poor are getting poorer while the rich are getting richer might be a bit wrong. I was willing to give it look. But the message, clear off, this is for private members only, didn’t offer the sort of welcome I expect from well-meaning souls. It was public when I posted the comment. For some reasons I had to change it to private. Thank you very much for the reply. The main argument is that in recessions the average person of te 1% of the richest people become poorer at a much faster rate than the average 1% of the poorest, since the poorest 1% have no assets. And the average wage cannot fall as dramatically as the average asset. I therefore conclude that in recessions rich become less rich faster than the poor become poorer, and in good times the rich become richer faster than the poor become less poor. Well, good God, what an utter tragedy.